Britain’s first farmland worm survey reveals nearly half of English fields lack key types of earthworm and may help explain a 50 per cent fall in song thrush numbers. Britain’s first farmland worm survey has revealed that nearly half of English fields lack key types of earthworm and may help explain the alarming decline of one of the country’s most loved songbirds. The citizen science project, in which farmers dug for worms in their own fields, has prompted 57 per cent of them to pledge to change their soil management practices – a move that may benefit the song thrush, for whom worms are a vital food source. The English population of the song thrush, popular for both its voice and its habit of using stones as an “anvil” to smash the shells of its other favourite food – snails – declined by more than 50 per cent between 1970 and 1995, leading to it being listed as a species of conservation concern. Do not feed the Kea the sign above advises. Ironic isn’t it? They’ve been fed 1080 unfortunately by the very corporation which purports to protect them. We know 1080 kills every breathing organism (according to Dr Meriel Watts) so what else can we expect? Ten thousand birds in one drop a Landcare scientist has calculated for one of DoC’s drops. This is so not rocket science & yet here we have another sad testimony of the increasingly silent forests. This one is from Carol Sawyer. HOLLYFORD VALLEY, FIORDLAND NATIONAL PARK, DEVASTATING AERIAL 1080 POISON DROP, OCTOBER 2017 – 18 MONTHS LATER, STILL DISASTROUS RESULTS – NO RECOVERY ! Yesterday I visited the Hollyford Valley in Fiordland. What a silent place, apart from the cicadas and the tourist traffic. This road is dangerously busy. One rental car passed me on a double yellow line…this is standard. A recent survey found this narrow winding road has, on average, 150 buses and 1200 cars on it every day. Knob’s Flat is about to have a $30 million lodge put in by the Milford Development Co, so the influx is going to be even greater. The 1080 drop in the Lower and Upper Hollyford Valleys in Fiordland, 5-6 October, 2017 has been an unmitigated disaster ! The area had never been 1080 poisoned before. These traps are set approximately 200 metres apart, and they are cleared every three weeks, weather permitting. For years, these traps averaged a total of 6 to 12 rats every three weeks, all up. Five months later, March 2018, the traps were cleared and contained 32 rats. Interestingly, some of the traps had two rats in them, which is apparently unusual. The following weekend the tally was 24 rats. That equates to 54 rats in a period of 6 weeks, whereas prior to the drop one could have expected, at the most, 12 to 24 rats to be caught in that time. Rats had NEVER been caught here in these numbers before ! Things have not improved. The latest trap clearance, February, 2019, yielded 19 rats and 7 stoats !! Gunn’s camp in the Hollyford was a Kaka haven. Twenty to forty Kaka were regularly seen there, and as many as fifty were counted on one occasion. All Kaka disappeared after the drop. Eighteen months later up to 3 Kaka have been seen and a Morepork was heard in the distance one night a while ago, according to regulars ( The “generator” Morepork was obviously killed by the poison. ) Fantails are gone. If you’ve noticed the same anywhere in NZ, please add your comments to our ‘Silent Forests’ page. Just let me know if you want anonymity or if I can add your name. Thank you. Apologies for the video in this article being removed. Facebook removed it from circulation so I have uploaded it via Youtube instead. Hopefully this will solve the problem. We are now told this has stopped because of the pest population, however, if you listened at the link above you’d know Te Urewera still has this very loud chorus & it has not been poisoned with 1080. Taranaki on the other hand has been well bombarded with the poison … 27 years worth. It seems to not be working then? I myself love photographing Birds, I have been doing it all my life, I did extensive Travel in South Is. when I was young, I have just returned from a Photography trip in Fiordland, So Sad the 1080 Poison has killed so many of the Birds, I only got 3 Good photos of Birds, compared with 50 odd in the 1970s, What I did see a lot of, was 1080 Poison Signs. Me and my sister used to take trips out to Kinloch to take our kids for ice creams and just enjoy the scenery. That was until we noticed warning signs for 1080 being dumped in the area and seeing multiple dead birds no way we were going to let our small children play there anymore! Finally remember the recent revelation from a LandCare Scientist that one of DoC’s South Island aerial 1080 drops would have killed an estimated 10,000 birds. And we’re supposed to believe 1080 only kills targeted pests? Mainstream has posted an opinion piece by Fiona McQueen on our diminishing birds. OPINION: Dave Hansford has launched yet another attack against those opposed to pest control in the Brook Waimarama Sanctuary, near Nelson. This sanctuary has just reopened, surrounded by a 14km pest-proof fence. It will be stocked with kiwi, kākāriki and kākā. The nasty part is that brodifacoum, a poison graded 8/10 for its ability to cause animal suffering, needed to be introduced first to kill pests inside the fence. It also killed native birds including weka and pukeko. Do the ends justify the means? A human equivalent would be if a ruling party decided to clear out a country, exterminating all unwanted people and restocking with different people who are representatives of a “chosen race”. Wait a minute, hasn’t that been done before? Andrea Midgen, chief executive of the SPCA, recently spoke out about the associated animal cruelty saying, “1080 (and other poisons) causes intense, prolonged suffering to animals and therefore we cannot support its use”. The flying range of our mutton birds includes the vicinity of Fukushima but how thorough is NZ’s testing for contamination? This is dated 2014. As always with detection of possible environmental contamination, the various industries tend to set the bar low enough to eliminate any public concern. Certainly this one does not look too thorough. All due respect to the small players that are of course powerless to stop the fall out from that disaster that still goes on… amidst the endless rounds of denial & cover up by the perpetrators. Listen further to the video which does get difficult to hear because of background noise in the location. Impact of Fukushima nuclear accident on native New Zealand Birds. More evidence on the apparent wanton decimation of NZ’s bird population by the deadly class 1A ecotoxin 1080, banned in most countries, with no antidote, dispensed by helicopters into the bush like a ‘veritable lollie scramble’ as I recently read it described by a person who for a long time worked with both 1080 poison & with DoC. Each bird had been grid referenced on a map and at a pest management strategy meeting in Christchurch (May 2009) a Landcare scientist was able to estimate the likely death toll… an astonishing 10,000 birds. Benfield describes the potential possum population in the reserve as being around 7-8,000 in which case he concludes, the pest management people (DoC & AHB) are poisoning more birds than there are possums. We know of course that 1080 can’t target just non-native birds. So the photos supplied by people of post-drop death counts invariably include examples of both. NOTE: the header image is not of the birds in question, these are from Paws 4 a Cause’s Facebook page, collected after another 1080 drop. There are many photos of dead birds collected by people directly after the drops. Regarding this article, there is an actual image supplied by Bill Benfield in his book (p71) however I do not at this stage have permission to use it. Please don’t bother asking for proof these ones died of 1080 poisoning. It is not rocket science as to why a collection such as these died when they were collected directly after a 1080 drop. And besides, the Landcare scientist and the folk at the said pest management strategy meeting in Christchurch, all took it as given that the estimated 10,000 birds died of 1080 POISONING, not other causes. No mention of any other possibilities for death with neither any mention of testing the said birds. Now that these items of information are coming to the fore thanks to investigative writers like Benfield, and to the dedication of the many thousands who recently & historically protested, the said authorities are racing hither and yon suddenly getting the birds tested to ‘prove’ that the folk who simply want clean water & food are getting unnecessarily hysterical. However, remember the 89 dead kiwi that DoC didn’t bother to test for possible 1080 poisoning? I rest my case. Clearly the authorities can no longer rest on their laurels and assume that the trusting NZ public are asleep like they used to be. William Benfield was an environmentalist author who wrote three books. The first two dealt with the widespread use of 1080 poison in New Zealand. The first is titled At War with Nature-Corporate Conservation & the Industry of Extinction, (find on Amazon) the second, cited in the article above, is “The Third Wave: Poisoning the Land”. His third book is called Water: Quality and Ownership. “This is a book about how the destruction of one of the world’s most unique, ancient and unspoiled wilderness areas has led to the growth of an international industry eradicating animals and plants which have been deemed to be “invasive”. That is because they are where pseudo-scientists say they should not be. What New Zealand began as an industrialised extermination has now become island eradications in many parts of the world. To expand and grow, it must either seek more islands, or widen its scope to cover whole nations; that is what it is now doing. •The academic and science institutions who see in it a rich seam of grant money for supplying junk science in support of the eradication industry. Eradications are carried out on a scale reminiscent of the US military aerial deforestation of Vietnam with “agent orange”. Here, for all wildlife, the animals, birds and insects, the poisons used are super-toxins such as brodifacoum and 1080. For vegetation, they have devised new wonder chemical cocktails such as “Armageddon”. It is total ecosystem genocide. To whip up a public fervour to help justify such mass environmental poisoning, the people are fed the concepts of invasive pests and threats. Thus, harmless creatures are demonised and need be shown no mercy. By deliberate and devious propaganda, the public are kept unaware, that in the blinkered rush of zeal to kill “pests” and “predators”, the eradication industry is killing everything else, even the rare and endangered species such as an entire monitored population of rock wrens from an aerial 1080 poisoning at New Zealand’s Kuhurangi National Park. This is a heart rending story. And one where surely insanity prevailed. Where did common sense go? 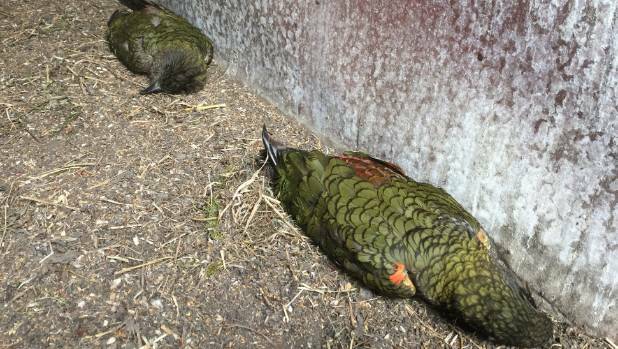 A Darfield family asked DOC not to take blood from their two 43-year-old kea, Casper and Stumpy. They did – and the birds were found dead less than 24 hours later. A Darfield family blames the Department of Conservation (DOC) for the death of their beloved kea Casper and Stumpy. The endangered alpine parrots have been part of Ron Stewart’s family since 1977 – but on Saturday morning he found them dead on the floor of their aviary. Less than 24 hours earlier, a DOC ranger and veterinarian took blood samples from the birds despite Stewart pleading with them not to. Kea Casper and Stumpy were found dead in their aviary on Saturday morning less than 24 hours after DOC staff took blood and examined the birds. DOC staff, “shocked” by the birds’ “unintended and deeply concerning” deaths, returned to uplift them for a necropsy on Monday. They were ordered from the property. The birds, thought to be about 43 years old, were given to Stewart and his late wife Dawn, an internationally renowned parrot breeder, by DOC’s predecessor, the Wildlife Service, in 1977. Casper had a head injury and Stumpy’s leg had to be amputated. They were unlikely to survive in the wild.